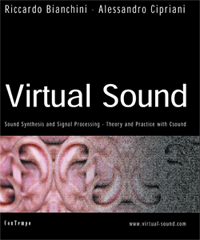 The Virtual Sound by Bianchini and Cipriani can be considered, along with The Csound Book by Richard Boulanger, a reference text for those interested in computer music and the use of Csound, the software developed by Barry Vercoe, and the last, chronologically, of the Music N family. The first section of the book, as we said, is dedicated to the presentation of the basic functions of Csound: how it works in different operating systems, the correct code syntax, the use of variables, writing a score or orchestra file and much more. The most interesting section, for users who already know the software, is the next one in which, through the various chapters, is described the implementation of different synthesis techniques (Additive, Subtractive, FM, Granular, Amplitude Modulation, etc. ), sound spatialization (Stereo, 3D, Surround 5.1, Quadraphonic, etc. ), implementation of special techniques or effects (vibrato, tremolo, chorus, flanger, reverb, echo, etc. ), then the use of MIDI and the application of Csound in real time, processing and importation of external sounds, until you get to issues closely related to mathematics and trigonometry, with even a chapter dedicated to proper writing and reading charts flow. On a general level, the book of Bianchini and Cipriani, also for its clear exposition, may be regarded as an excellent introduction to general issues that relate strictly with digital audio. Inside the “official” text, there are a number of further reading. The first is that of Nicola Bernardini, dedicated to the use of Csound with Linux. Then there is a reading of Riccardo Bianchini on the possibility of generating CSound scores using other software or languages. James Dashow (who also wrote the preface at this book) addresses the issue of additive synthesis controlled by Dyads. Then remember the article of Agostino Di Scipio (Sound Synthesis by iterated Nonlinerar Functions) and that of Eugenio Giordani devoted to granular synthesis. The last reading is that of Gabriel Maldonado about Directcsound and the use of Virtual Midi Control Interface (VMCI). In the last pages of the book, some utilities: an opcodes list with their syntax, a table with the most common error messages and a collection of websites, generals or specific for Csound. 2003’s edition (revised and expanded) contains a CD-ROM with utilities and a collection of instruments presented inside the book. In truth it must be said that the multimedia attachment is rather meager, especially when compared to the attachments presented in The csound Book. On the other hand, on www.virtual-sound.com it’s possible to download a book demo of 168 pages.